Solve everyday problems and receive gifts of spiritual insight as you enter the enchanting world of fey. 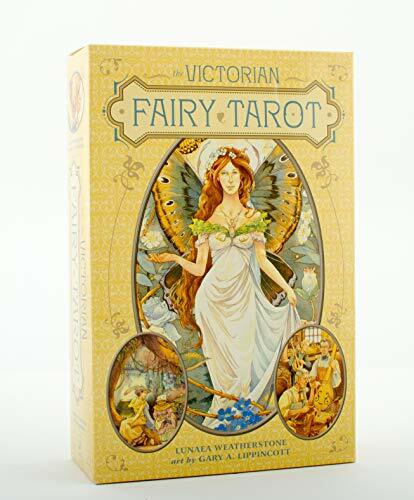 The Victorian Fairy Tarot combines the romance and elegance of the Victorian era, mystical fairy imagery, and the wisdom of tarot. Guiding your journey is an in-depth book, which shares fairy lore, explains each card, and teaches you how to interpret them. This beautifully crafted Rider-Waite-based tarot is ideal for new or experienced tarot readers. Gary A. Lippincott (Petersham, Massachusetts) has won numerous awards for his fantasy art, which is in many collections worldwide. Books he has illustrated include Bruce Colville's Jeremy Thatcher, Dragon Hatcher and Jane Yolen's Come to the Fairy Ball, and his cover art has graced works by such authors as Ursula K. Le Guin, J.R.R. Tolkien, Tanith Lee, and Charles DeLint.